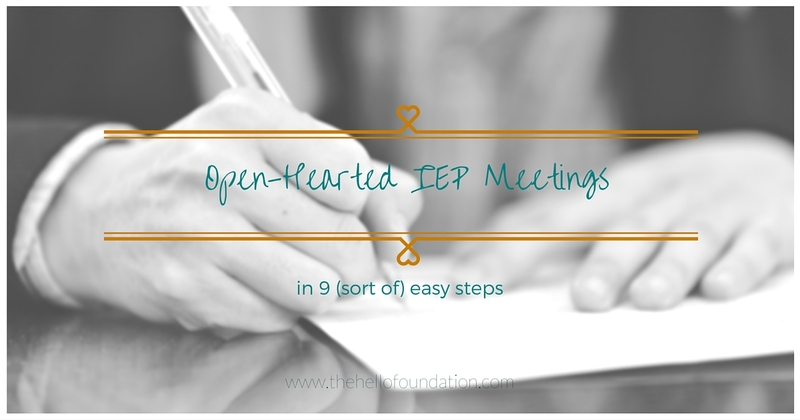 I was recently doing my morning Twitter scroll when I came across a post on The Mighty titled 21 Emotions Special Needs Parents Experience During an IEP Meeting. I like parents. I like emotions (mostly). I tolerate IEPs. Seemed like something I should read. Do I make parents feel like this when they’re in a meeting with me? Oh no. Nope. No way. That’s not why I got into this profession. That’s not why I sit down at that table. I’m different. But there was nowhere to run. Reading that post had forced me to take an unflinchingly honest snapshot of my practice. I couldn’t unsee it. Even though I have never intended to elicit the emotions that post illuminated, I’ve done it. I’m sure of it. Here’s the thing: all too often, parents and special ed professionals are set up to be adversaries. It’s hard for both sides to stay open and trusting when The System seems to revolve around fear — fear of malpractice, of administration, of lawsuits, of missed opportunities, of not knowing, of being taken advantage of. And my truth about fear and IEPs? It can be scary when a parent sits across from me and bursts into tears. Or starts yelling at me. Or threatens my livelihood and property. Or pleads with me for the Cadillac their child deserves when all I’m empowered to offer is the Ford Fiesta that will get the job done (no offense to Ford. or Fiestas. It’s a metaphor.). I’m not so delusional as to think that I’m going to change The System, but what if, in my own meetings, I there are things I can do to change the culture of fear? To create a bubble of honest, open communication, mutual respect, and, dare I say it . . . love? Things that will better honor the parent experience and in the end, make life better for the students I serve? Yes. I can do that. I think. So, in that spirit, I humbly present to you my newly-formed, sure-to-evolve, take-them-in-the-spirit-in-which-they’re-intended . . .
Talk about the feels. Acknowledge that this isn’t anybody’s idea of a good time. Have tissues. Don’t be afraid to use them. There’s being professional, and then there’s being a robot. Nobody likes robots. Unless they’re vacuuming your floor. In which case, robots rule. Remove win/lose, black/white, good/bad language from your vocabulary. Life in special ed is a million shades of gray, and winning and losing should be reserved for sports and Chutes and Ladders. Shut-up. And listen. And make eye contact even when it feels scary. Cool it with the jargon. I know using 1000s of acronyms is the birthright of people in special education, and in a very practical way, they make our professional conversations easier and shorter. But really, it’s a foreign language that serves to alienate anyone who doesn’t know the secret code. Have some that you just can’t live without? Write them down on your agenda. Make a cheat sheet. Have gratitude. Express it. Out loud. To everyone. There is always something to be thankful for (even if it’s just the fact that someone remembered a pen). Check in later. Do you know that sinking feeling when you’ve just walked out of Target having spent an obscene amount of money and you have literally no idea what’s in your 5 bags? Wouldn’t it feel nice if someone in a red t-shirt called you later and said, “Hey, I’m just checking in to see how you’re feeling after all of that. It can be a little overwhelming in there.” Be that red-shirted person on the phone. I’ll screw this up. I’m pretty certain of it. Because I’m human. But that’s just the thing. Everyone around that table is human and that, above all else, is the most important thing for me to remember. I just found this site! I am so excited and wanted to thank you for the wonderful share. Aw, thanks @disqus_zMLhJxNqPH:disqus! I’m glad you liked it 🙂 Our blog isn’t behaving itself of late, so please don’t hesitate to let me/us know if you run into any hiccups here! Such a wonderful post! Thank you for sharing. Thank you so much, @disqus_NFcv6XQZ2r:disqus. I’m happy to hear that you enjoyed it!